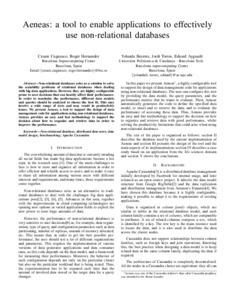 Cugnasco, C.; Hernández, R.; Becerra, Y.; Torres, J.; Ayguade, E.
Non-relational databases arise as a solution to solve the scalability problems of relational databases when dealing with big data applications. However, they are highly configurable prone to user decisions that can heavily affect their performance. In order to maximize the performance, different data models and queries should be analyzed to choose the best fit. This may involve a wide range of tests and may result in productivity issues. We present Aeneas, a tool to support the design of data management code for applications using non-relational databases. Aeneas provides an easy and fast methodology to support the decision about how to organize and retrieve data in order to improve the performance. Cugnasco, C. [et al.]. Aeneas: A tool to enable applications to effectively use non-relational databases. A: International Conference on Computational Science. "Procedia computer science, Vol. 18, 2013". Barcelona: Elsevier, 2013, p. 2561-2564.